This past weekend was the 2nd Annual Knit City event here in Vancouver. The event was held over two days and included workshops, knit-ins, a talk by the Yarn Harlot (who also wrote a blog about her experience of the event), and of course, the ever-tempting marketplace. 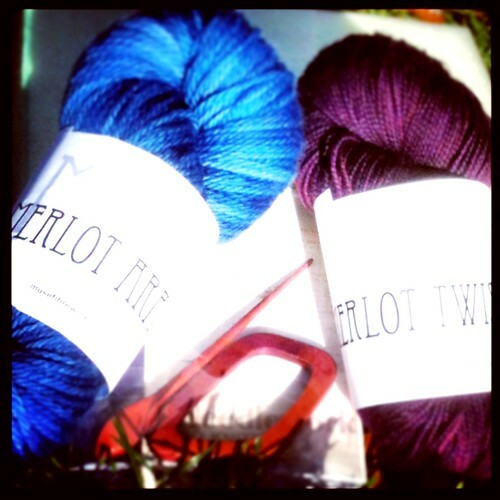 The blue tonal yarn is a worsted/aran weight yarn that will become a hat for my boyfriend. I have a pattern waiting in the wings for that yarn, but I’m keeping it under-wraps as its for Christmas (there’s that darn C-word again). The plum yarn is a sock yarn that I’m saving for myself. I have often lusted after patterned socks listed on Ravelry, but 99% of the time all I have in my stash is a variegated or self-striping yarn that would obliterate the pattern from being seen for the colours. I don’t have a pattern waiting in the wings for this plum sock yarn yet, but I’m already day-dreaming about having lovely plum tootsies. The other item in this photo is a shawl pin by Pollika (another local supplier). In total, I spent $42.50 in the market. I call that a success! In other news, I’m thisclose to finishing nephew sweater #1. And I’m planning on knitting nephew #2’s sweater all within the month of November as part of the NaNoSweMo or National November Sweater knitting Month. But really, maybe I’m just way to ambitious for my own good when it comes to knitting. Only time will tell! You are currently reading Knit City Round-Up at When Gaia Smiles.